Chesapeake Shores just wrapped its second season this month, and Hallmark Channel reports the series has broken ratings records for the network. 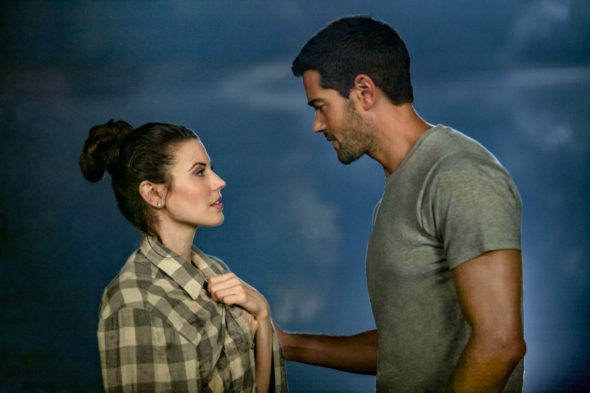 The Canadian-American drama centers on career woman Abby O’Brien (Meghan Ory), a divorced mother of twin daughters who returns to her hometown of Chesapeake Shores, Maryland. The cast also includes Jesse Metcalfe, Treat Williams, Diane Ladd, Laci J. Mailey, Emilie Ullerup, and Barbara Niven. As of reporting, Hallmark Channel has not announced a season three renewal for Chesapeake Shores. However, with season two’s high ratings, another season seems very likely. New York, October 13, 2017 – The second season of Hallmark Channel’s original primetime scripted series “Chesapeake Shores” ended on a high note this past weekend, with the Sunday, October 8, finale episode averaging a 2.2 L+3 HH rating and 2.3 million Total Viewers. Season two of the multi-generational family drama “Chesapeake Shores” follows Abby O’Brien, a high-powered career woman, divorcee and mother to twin daughters, as she adjusts to life back in her hometown of Chesapeake Shores. Abby now balances a budding relationship with her former high school sweetheart, Trace, working for a firm that does business with her uncompromising father Mick and raising two young daughters. While Abby’s once-estranged mother, Megan, strives to reestablish relationships with Abby and her siblings, the O’Brien clan primarily looks to their wise grandmother Nell for guidance as they navigate life, love, career and romance. Based on the novels of the same name by New York Times bestselling author Sherryl Woods. Stars Meghan Ory, Jesse Metcalfe, Treat Williams, Barbara Niven and Diane Ladd. What do you think? Do you watch Chesapeake Shores? Did you enjoy season two? More about: Chesapeake Shores, Chesapeake Shores: canceled or renewed?, Hallmark Channel TV shows: canceled or renewed? I find the absence of any non-white characters of any significance shocking and disturbing. Showing some non-white characters would not detract from the (fairly simple) plotlines. This mono-cultural depiction is not remotely a reflection of America today and one wonders what message the series is attempting to convey with its total lack of diversity of any kind (racial, sexual orientation or other), and fairly gender stereotypical characters. Very worrying, particularly in today’s US context.